Elephants are the largest living land mammals. The largest elephant recorded was one shot in Angola, 1974. It weighed 27,060 pounds (13.5 tons) and stood 13 feet 8 inches tall. Their skin color is grey. At birth, an elephant calf may weigh 100 kg (225 pounds). The baby elephant develops for 20 to 22 months inside its mother. No other land animal takes this long to develop before being born. In the wild, elephants have strong family relationship. Their ways of acting toward other elephants are hard for people to understand. They "talk" to each other with very low sounds. Most elephants sounds are so low, people cannot hear them. But elephants can hear these sounds far away. Elephants have strong, leathery skin to protect themselves. There are two living genera of elephants. These are African Loxodonta africanus, and Asian elephants Elephas maximus. An elephant's most obvious part is the trunk. The trunk is a very long nose, made from the upper lip. An elephant uses its trunk to grab objects such as food. Though the rest of an elephant's hide is strong and thick, its trunk is very soft and sensitive. Elephants avoid Acacia trees with symbiotic ants because they can bite the inside of an elephant's trunk. Elephants also have tusks. Tusks are large teeth coming out of their upper jaws. A lot of ivory comes from elephant tusks. Ivory traders killed many elephants, so now hunting them is illegal. The trunk is also used when it trumpets. The elephant usually stands still, raises its trunk, and blows. This is a signal to other elephants and wildlife. 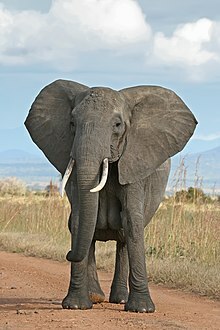 African elephants are larger and have bigger ears. They are grazers who still do quite a lot of browsing: they eat leaves, branches and grass. These big ears have many veins, which carry blood throughout the body. Biologists think that the blood going through their ears helps African elephants to cool off. The weather is hotter in Africa than in Asia, so it is hard for elephants to stay cool. Female African elephants have tusks, but female Asian elephants do not. African elephants have a low place in their back. African elephants have two "fingers" at the end of their trunks, but Asian elephants only have one. Indian elephants eat mainly grass. Grass wears down their teeth because it has a high concentration of silica and is very abrasive. Elephants use their teeth in sequence, not all at once. This means that, at any time, they only have one tooth in each jaw, a total of four. In total, they have 24 teeth: 12 front teeth, called premolars, and 12 back teeth, called molars. When the last molar wears out, the elephant dies because it cannot eat. They can live for about 70 years. But in a zoo or circus, people can keep elephants alive by feeding them soft food. Some African elephants live on the savanna while others live in the forest. Today, many people think these are different species. Scientists named the forest group Loxodonta cyclotis and the savanna group Loxodonta africanus. Elephants are distantly related to sea cows, which are large aquatic mammals. Early ancestors in the Palaeocene and Eocene were small, semi-aquatic animals. By the Miocene several groups of large mainly forest-dwelling elephants evolved, the gomphotheres and deinotheres. Their teeth show little wear, indicating a diet of soft, nongritty, forest vegetation. Modern elephants – the actual family Elephantidae – evolved from gomphotheres as the climate became cooler and drier in the Pliocene and Pleistocene. This includes the mammoth and mastodon as well as modern elephants. The gomphotheres lasted a long time, and were hunted by modern man. There was a change in plant resources, with the reduced forests and extended grassland. This favoured specialist grass feeders over generalist eaters. This change in the dietary supply was one of the factors which forced gomphotheres toward extinction in the late Pleistocene in South America. The remaining population probably succumbed to climatic change and/or human predation around the time of the Holocene margin. The significant thing about modern elephants (especially Indian elephants) is that they eat grass: they are primarily grazers, rather than browsers. Compared with gomphotheres, the teeth of modern elephants are quite different. Humans have used elephants for different things. The Carthaginian general Hannibal took some elephants across the Alps when he fought the Romans. He probably used the North African elephant, a kind of elephant that does not live today. It was smaller than other African elephants. Elephants are used by tourists as rides. A Bombay man rides on an elephant. People have used Indian elephants to move around and to have fun. Many circuses have them. Siamese, Indians, and other South Asians used them for several things. They fought in armies, and they crushed criminals. They also did heavy work like lifting trees and moving logs. However, people have never domesticated elephants. Domesticated animals are tame and have babies under human control. The male elephant in heat is dangerous and hard to control. This state is called musth. Most elephants used by people are female, except those used in war. In a battle, female elephants run from males, so armies needed males. Elephants are used by tourists for riding. Both African and Asian elephants are endangered species. African elephants receive some legal protection in every country where they are found. However, 70% of their range exists outside protected areas. Conservation efforts in some areas have led to more elephants. Local numbers may be controlled by contraception or moving the elephants to other places. Large-scale culling (legal killing) ceased in 1988, when Zimbabwe stopped doing it. In 1989, trade in elephants and their products (ivory, meat) was made illegal. Appendix II status (which allows restricted trade) was given to elephants in Botswana, Namibia and Zimbabwe in 1997 and South Africa in 2000. In some countries, sport hunting of the animals is legal: Botswana, Cameroon, Gabon, Mozambique, Namibia, South Africa, Tanzania, Zambia, and Zimbabwe have export quotas for elephant trophies. The IUCN estimates a total of around 440,000 individuals for 2012. The total population of Asian elephants is about 40,000–50,000 (a rough estimate). Around half of the population is in India. Although Asian elephants are declining in numbers overall, particularly in Southeast Asia, the population in the Western Ghats may be increasing. A female elephant will have a single baby (called a "calf") every four or five years. Calves are born 85 cm (33 in) tall and weigh around 120 kg (260 lb). An elephant's gestation lasts about 22 months. Another female elephant often stays with the new mother until its baby is born. The newborn elephant can often stand within a half hour after it is born. Mother elephants touch their babies gently with their trunks. It takes a baby a year or more to control its trunk and learn its many uses. Baby elephants nurse for the first two years of their lives. After it is born, the first thing that the baby does is wobble in search of its mother's milk. It drinks about 10 liters of milk every day. White elephants are considered holy in Thailand. Ganesha is the god of wisdom in Hinduism. He has an elephant's head. The elephant is the symbol for the United States Republican Party. It is like the Democratic Party's donkey. The first person to use the elephant as a symbol for the Republican Party was Thomas Nast. He did that in a Harper's Weekly cartoon in 1874. ↑ "Hungry Elephants Are No Match for Fearless Ants : Discovery News". news.discovery.com. Retrieved 2 December 2010. ↑ "Extinction of a gomphothere population from Southeastern Brazil: Taphonomic, paleoecological and chronological remarks", Quaternary International, Cristina Bertoni-Machado 2012) (abstract). Retrieved 16 June 2014. ↑ "Endangered Animals - Elephants - UEN". uen.org. Retrieved November 11, 2010. ↑ Kennedy, Robert C. "Cartoon of the Day: "The Third-Term Panic"". Harpers Weekly. Retrieved 2008-11-03. Tim Radford: - "The elephant time forgot", The Guardian 2001-08-24, 1. Describes the discovery of the third species of elephant. This page was last changed on 30 January 2019, at 15:05.